This week is the TUC’s I Heart Unions Week (February 11-15). Each day on UniteLive, we will bring you an inspiring story. Today (February 11) we meet the Unite members from TGI Fridays who are fighting for fair tips and pay justice. A mass rally in October last year in central London’s Leicester Square – a main artery of the capital’s network of high street clothing shops and restaurants – was no ordinary gathering. Chants of ‘if we don’t get it shut it down’ and ‘I believe that we will win’ reverberated triumphantly as shoppers, tourists and other passers-by stopped to watch a growing and confident group of people who naysayers have long said could never be organised. They were young, they worked in some of the most insecure and low-paid jobs in one of the most expensive cities on earth, and, up until only a few months ago, many of them had never even heard of a union. In an historic co-ordinated strike action, Unite TGI Fridays workers joined Wetherspoons, McDonalds, Uber, UberEats and Deliveroo workers to demand better pay and working conditions. They were joined by young union members from across the world who stood together, unwavering in their demand for fairness in their workplaces. 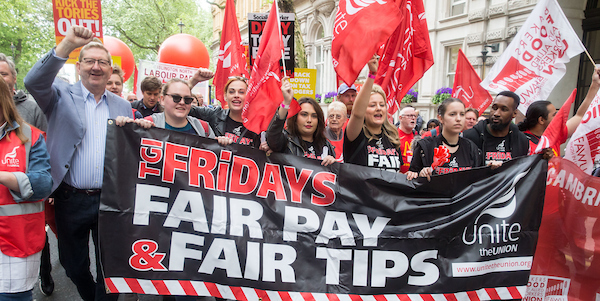 TGI Fridays workers were striking for the eighth time in response to a tipping policy, introduced earlier this year, that swipes 40 per cent of waiters’ card tips and redistributes them to kitchen staff. The move has left many staff about £250 a month worse off. Unite member Boni Adeliyi (pitured), was set to go to drama school this autumn – but after losing her tips, she’s had to postpone a dream of hers that had been years in the making. October’s strike and rally came just days after Prime Minister Theresa May announced at the Tory Party conference that the government would introduce legislation barring restaurants from keeping staff tips. The announcement was a major victory for the serially underpaid, overworked and mostly young people who work in restaurants like TGI Fridays whose tips are their lifeline. This result was the outcome of years of Unite-led campaigning on tipping justice, which started in 2015 with Unite pressuring restaurants such as Pizza Express to stop the practice of deducting a percentage of staff card tips in so-called ‘administrative costs’. The campaign was largely successful – it caught the public and the media’s attention and many restaurants stopped deducting tips. But Unite went further and brought pressure to bear on the government to end tipping injustice once and for all through legislation. The public outcry provoked by the Unite campaign forced the then business secretary Sajid Javid to pledge to introduce reform. His promise went unkept for more than 800 days after his consultation on tipping practices closed. Throughout Javid’s silence, Unite continued to hold the government’s feet to the fire until they relented, when the prime minister finally pledged to take action in October. But Unite regional officer Dave Turnbull believes the fight for tipping justice is far from over. “This step in tackling tipping abuses has been a long time coming and is in no small part down to the determined campaigning of Unite and its members,” he said. “As ever the devil will be in the detail of the legislation the government brings forward. Whatever the result of workers’ fight to keep the tips they rightfully earn, one thing is certain – these young, organised workers aren’t going anywhere anytime soon. As Unite rep and TGI Fridays waitress Lauren Townsend explained, their consciousness as workers part of a machine that sees them as disposable has been irrevocably awakened. TGI Fridays has since last year agreed to have employee representatives decide how tips are shared out, and also said it would distribute 35 per cent of waiters’ card tips, instead of 40 per cent to kitchen staff. “It’s not huge, but from a company that wouldn’t even sit down and listen to workers concerns six months ago it’s a good start,” Turnbull said. Tomorrow’s (February 12) I Heart Unions story will be the inspiring vision behind Unite’s period dignity campaign. 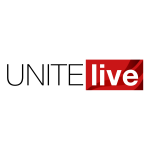 Stay tuned to UniteLive for more I Heart Unions coverage throughout the week.